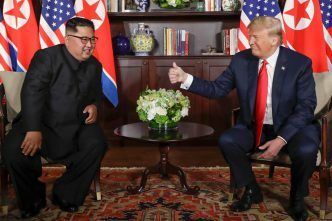 Advances in science made the Trump–Kim Summit possible. North Korean scientists’ achievements with nuclear bombs and intercontinental missiles played a part, but the unsung scientific masters were the Singaporeans. They seem to have perfected a high-power ego containment device that enabled Donald Trump and Kim Jong‑un to be in close proximity without an explosion or fusion event. That proximity allowed a familiar thing in history to occur: two Great Men looked into each other’s steely eyes and come to an understanding. Or at least think they have. I witnessed this phenomenon many times when in government service. It usually took several months and examples of the behaviour they had been briefed about earlier to recur before the starry-eyed bromance ended. It was a study in interests mattering more than personality. Which brings me to the summit. Great news that the North Korean and US leaders are talking rather than exchanging missile salvoes. Great news that more meetings are planned. Not so great news that Kim Jong‑un has managed to do nothing new, but instead has ‘reaffirmed’ that North Korea ‘commits to work toward complete denuclearisation of the Korean peninsula’. In diplomacy, ‘reaffirming’ is a deliberate word that states that no new concession or statement is made. It’s a formal way of just repeating yourself. And any parent knows that ‘committing to working towards’ cleaning their room is their adolescent child’s way of saying that it ain’t going to happen. 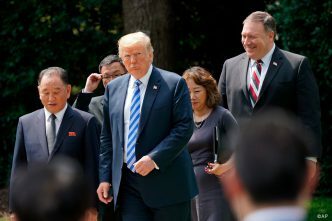 But the most important thing about the summit was what it revealed to US allies and partners about how President Trump’s long-held views on alliances are informing his negotiations with North Korea. His America First philosophy is starting to be a program of work. Giving Kim the gift—without any reciprocity from Kim—of ending ‘war games’ with the United States’ South Korean ally could be seen as establishing Washington’s good faith early. The way Trump talked about it, though, shows the deeper problem: the first reason for doing this that came to Trump’s lips in his hour-long press conference was that joint US–South Korean exercises cost ‘a tremendous amount of money’, so not doing them would save Washington a lot of cash. It also appears that Trump hadn’t foreshadowed this gift with the South Koreans before announcing it to the waiting world. It’s America First, with this not being an isolationist America as some feared, but arguably something worse: a unilateralist US that makes narrowly based decisions that are in its immediate transactional interests, without care for the interests of close allies, and without regard for the consequences for American power and influence that are exerted through its global security partnerships. This is a path for making America small again because it misses what has made America the successful global superpower—the multiplier effect of its partnerships and alliances. That’s cheap at twice the price, if security, influence and prosperity are your goals. This matters because a unilateralist conception of America in the world is likely to result in much bigger security issues being unwittingly or deliberately thrown under the bus as Trump lurches from one summit ‘success’ to another. It’s not hard to imagine Trump triumphantly announcing that he and Kim have agreed to North Korea dismantling its ICBMs in exchange for Trump removing the protection of the US nuclear umbrella from South Korea to give Kim the security guarantee he wants. It’s even easier to imagine Trump announcing the withdrawal of the 32,000 US military personnel stationed in South Korea in exchange for a move from Kim. (Trump mentioned in his press conference he wants to bring them home, presumably to save that cash again.) Both steps would fit with the Trumpian America First program, but done in a unilateral way, both would undercut its security role in Asia. Shinzō Abe must be thinking hard about how he further reinforces the idea that if Trump were to agree to end US provision of extended deterrence to South Korea, that would sow great doubt in the minds of Japan’s leaders about the value to Japan of US security guarantees and extended nuclear deterrence. The problem is that Abe will already have stressed this, but may have no confidence that Trump, even if he understands, cares much about it. Two last points about the summit and the future. First, of the two Great Men who looked into each other’s eyes, one will be in power for life (however long or short that is) and one will be in power for another two to six years. 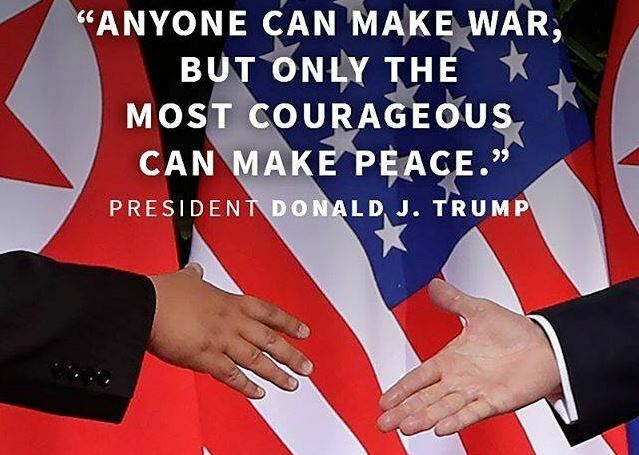 Kim knows that any Great Man agreement he reaches with Trump has to outlast Trump. He knows the Iran deal turned out not to outlast Obama, and he knows that the US is divided already over the deal that Trump may strike with him. Kim has been groomed to lead North Korea against the international community, and that the possession of credible nuclear weapons and missiles that can deliver them sat at the pinnacle of his grandfather’s and father’s ambitions for the North Korean state. He understands showmanship and seems to understand how to feed the Trump ego to his advantage. Unlike Trump’s allies and partners at the G7, he doesn’t want to plead with Trump. He wants Trump to recognise his strength and give him concessions. He is willing for Trump to look good as he does so. Slow rolling deals while extracting what he needs still seems to be his plan. 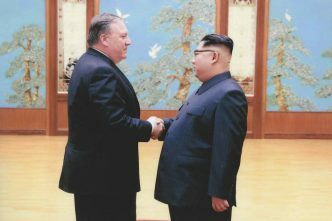 Second, US–North Korean leaders’ meetings are great—not enough to resolve the competing strategic and security interests that flow through the Korean peninsula, but bigger than whether the peninsula does or doesn’t denuclearise. That’s why the previous six-party talks existed—because Japan, South Korea, China and even Russia have dogs in this fight. Trump is unable to represent his allies’ interests effectively, mainly because he doesn’t share them. And neither Xi Jinping nor Vladimir Putin can be happy to engage in secondhand shuttle diplomacy with Kim or Trump. This means we need to look to Singapore for another scientific breakthrough: an interests-coupling device that allows the strategic interests of those other powers to be brought within the ego containment field that has done its work so well this week. That breakthrough seems some way off. Michael Shoebridge is director of the defence and strategy program at ASPI. 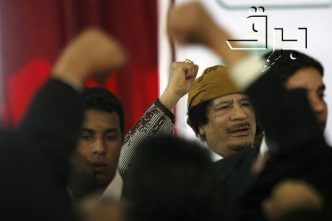 Edited image courtesy US Department of State via Facebook. Singapore summit: more than meets the eye?